You want to give a special gift, which has a spanish taste, but original? 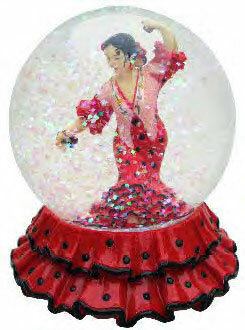 We have the snow ball with flamenco figure with a red dress and black polka dots, castanets, shawl, earrings, flowers and shoes. When you shake the ball, a shiny glitter falls over. Don’t forget that this object is not a toy. Decorative use.